Me-too 49-key controllers have been mind-numbingly dull for the most part. 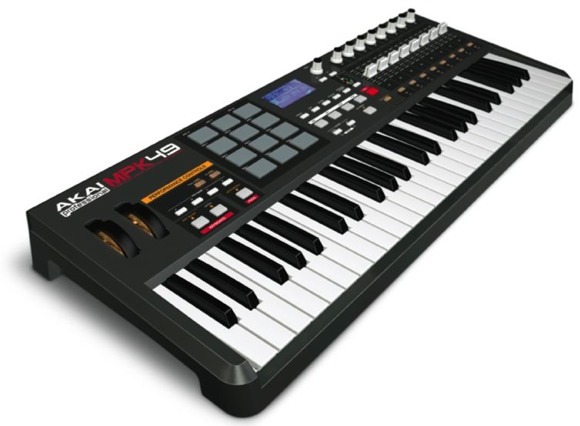 The new Akai MPK49, revealed in Frankfurt at Messe, easily qualifies as different. Not only does it add trigger pads as found on the MPC line, but there’s an onboard arpeggiator, functionality borrowed from the MPC, and additional MIDI control options, as well. It’s a control surface: 8 endless encoders, 8 sliders, and 8 backlit switches, each of which can be controlled via 3 selectable banks (8 x 3 = 24 “virtual” controls each, 72 controllers total). It’s an MPC-style controller: 12 pads, yes, but unlike the pads on the Korg Kontrol49 or the M-Audio Axiom, it actually functions like an MPC, with note repeat and swing functions. Hopefully the quality will be closer to a standalone unit, as well. It’s an arpeggiator: Akai’s mum on the details, but there’s an onboard arpeggiator in the unit — a rarity in controllers. And it’s got a full-sized, 49-key keyboard, expression input (thanks! ), and a big LCD screen. Looks terrific, though my only question is the quality of the keyboard; I’ve been a bit disappointed with recent entries from Alesis on reliability and feel. (Alesis, Akai, and Numark are now made by the same company; you’ll notice the similarity of this to Alesis’ MIDI controller line.) No pricing or availability yet, but given this unique combination of features, we’ll definitely be watching. First seen at VJ blogger S.O. Sample‘s site, and I have to say, this could be an unbelievable VJ keyboard.